Every Thursday Parents bring their children to the Spring of Hope office to be seen by the Occupational Therapist. On average we receive 15 parents a week. For the parents this has had such a large impact, as parents who never took their children out of the home are now attending. Counselling: One parent is now bringing her child to Drop-in; before coming to Drop-Ins her child was often left on the ground with flies hovering over her. Now the child is no longer in this situationb as the parent is meeting other parents through Drop-In and the other parents are counselling which has helped her to realise how special her daughter really is as a child. Out of the outreach clinics we saw many of our children needing epilepsy medication, and so the start of giving free epilepsy medication began. In Wabwoko, we are now treating 150 people per clinic and 80 in Kangulumira.Children who were unable to go to school, are now able to attend school. There is a belief that seizures are due to a demonic attack. 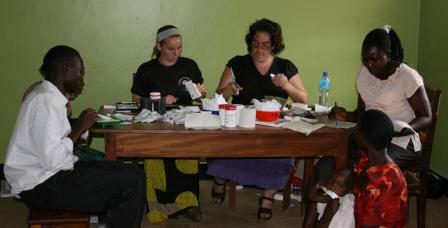 The medication allows for seizures to be minimized or non-existent, and thust allow kids to be able to go to school. On the first and second Friday of the month, we host rural assessment clinics. Parents can bring children so they can be assessed and the parents can be trained on developmental exercises for their child. The clinics are in two different locations: Kangulumira and Wabwoko sub counties. Currently within each clinic, see over 120 children. Through these clinics we have seen massive break through because parents have learnt they are not alone. This has decreased negative stigma they once had towards their child. We also have seen much change in the child now that the parents are becoming more involved with their child's development. We just started Parish Clinics in January 2012. At a Parish Clinic we teach a lesson from the Bible through the use of puppets that deals with children with disabilities. The clinics will also provide training for parents in how to help their children, as well as decrease negative views they may have. Another component involves counseling and spiritual support, as it is not easy raising a child with disabilities. Our hope is that eventually Parent Committees will take ownership over the clinics and give input as to what Spring of Hope can provide for the particular Parish (a Parish is like a region, area, or district that is made up of about six villages).